A Let Joe Know volunteer pushes for extended warranty coverage. Will your warranty cover the mess your broken appliance makes? Linda Wilson of Carefree found out the answer in a smelly way. Her refrigerator had broken while she was out of town. "All the food was rotten," she says. 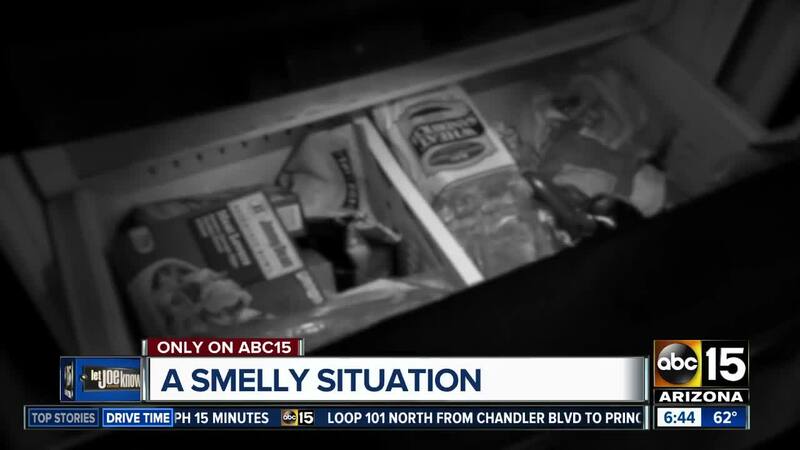 House-sitting neighbors figured out what was wrong after several days of searching, but by that time, Linda says the smell "got into the insulation" of the refrigerator. When she returned home she says the stench was unbearable. "Nothing would make it better," she says. She bought a new refrigerator and says she was told her Lowe's extended warranty would pick up the funky fridge, reimburse for spoiled food and buy back the original appliance. "But that isn't exactly what happened." She says the original approval she got from the company turned into an explanation of only the parts being covered. "I say, you can't live in a house where it stinks like that." By the time she spoke to the fourth person about it with no progress, she let me know, and ABC15/Better Business Bureau volunteer Grant helped out. Grant convinced the folks at Lowe's to give Linda's claim a second look. Linda says within hours she got a call from the company. "The lady was more than happy to do the buyback," she says. Within a few weeks, she got a check for more than $2,800. We want to say a big thanks to Lowe's for reconsidering Linda's claim. Extended warranties have a lot of exceptions, but if there is a gray area, get ready for a fight.